Much of Graham Harman’s so-called ‘object-oriented philosophy’ takes up Martin Heidegger’s account of the nature of tools and equipment, as set out in the first part and first division of his major work Being and Time. The key problem I have with Harman’s reading of this account is the overly binary view of perception which I think misses out a key part of the process of using tools. Heidegger’s now famous example describes how a piece of equipment like a hammer can be approached in two distinct ways: We can either pick it up and use it, or we can contemplate it from a distance. When we pick up the hammer and use it, it becomes what Heidegger calls ‘ready-to-hand’, the hammer is ready to be put to work, assuming we know how to wield it. In the second case, what Heidegger calls ‘present-at-hand’, we simply stare at the hammer as an object, trying to make sense of it by some kind of intellectual analysis. In this case Heidegger claims that we never uncover the true being of the hammer as a tool, we are simply confronted with a curious lump of inert physical stuff. The interesting thing about using the hammer, in the ready-to-hand relation, is that when we are skillfully deploying it as a tool it begins to disappear from view. It withdraws from our conscious perception as we concentrate instead on the task ‘in hand’ – in other words our attention moves from the hammer towards the nails being driven into the wood. When everything is working well, we have no need to think about the hammer, instead we can just enjoy the experience of getting a good job done. Now that’s all fine until something interrupts our progress, until something goes wrong with the process of hammering and the nails stop disappearing into the wood. In this case, according to Harman’s reading we immediately enter a state of ‘breakdown’, the hammer re-appears in our conscious perception when it refuses to do its job. The problem with this kind of ‘all-or-nothing’ account is that it assumes an instant transition – a kind of sudden gestalt switch between figure and background like we get with those optical illusions of faces and goblets. If that were actually the case it seems difficult to understand how we could ever move from one condition to the other – for example we could never work out how to use an unfamiliar tool, as there seems to be no room in this account for the process of learning a new skill. The other problem with this sort of ‘on-off’ reading is accounting for other kinds of interruptions to the normal feeling of ‘flow’. And this is where Heidegger describes the tool as being ‘un-ready-to-hand’ – another category of experience that Harman doesn’t seem to want to mention. Without getting too bogged down in the detail, Heidegger describes three ways in which tools can be un-ready-to-hand, and I’ll just list them in reverse order, so I end up in the right place in the argument: The third example he calls ‘Obstinacy’, which is where things get in the way of doing the job. Now this might be because we have to clear the space on the work-bench before we can even begin with the new activity, or it might be that we have to fix the tool that we broke last time we used it. Now, to me, the kind of circumspection that Heidegger is referring to here is a special kind of perception that we would have to look to Merleau-Ponty to help us understand. What I think is happening here is a function of what Merleau-Ponty calls ‘bodily intentionality’, a bodily grasp or ‘felt sense’ of what seems to be working in a particular situation. This is part of that familiar experience of running on auto-pilot that we often get when we’re driving a car – we don’t need to keep thinking about putting our foot on the clutch, it just happens when we need to change gear. The bodily grasp of a task provides a kind of persistent background awareness, a process of monitoring that allows us to make sure the tool is still ‘on track’ – to make continual minute adjustments to keep the saw-cut from wandering off, or to keep the hammer-head hitting the nail, instead of crashing down onto my thumb. So, I would argue, in the case of tools and equipment there is no such thing as ‘total withdrawal’ in the way that Harman appears to be claiming. Both Merleau-Ponty and Hubert Dreyfus describe this background awareness as part of my bodily skill, that repertoire of skills and abilities that maintains my ‘peripheral awareness’ of the so-called withdrawn tool when my conscious attention is directed elsewhere – ie on the task in hand. Merleau-Ponty describes the tool becoming incorporated (literally) into an extended ‘body-schema’, as a kind of prosthetic bodily extension that allows me to experience the world through it. 1) By always transcending or exceeding any attempt we might make to grasp them completely in perception or representation (whether in use or in language). What Harman likes to call the ‘shadowy subterranean depths’ of an object’s being-in-itself, of which the object’s being-for-us is just one particular partial version..
2) By withdrawing into the background of our awareness when we are concerned with something else – i.e. becoming just another component of the ‘lifeworld’ of objects that forms the ever-present back-drop to our current activity. 3) And as the tool through which I am experiencing the world ‘right now’ in the fulfillment of a specific task. I.e. the object as an extension of my body that recedes from my conscious awareness when I am focused instead on the task ‘in hand’. This is the ‘ready-to-hand’ of Heidegger’s tool analysis that remains constantly on the edge of ‘breakdown’, while still being continually monitored through a kind of habitual or background awareness – what Merleau-Ponty calls bodily intentionality. It’s this third case that I think is the one most seriously overlooked in Harman’s analysis, serious because I think it confounds his binary reading of Heidegger’s ‘tool and broken tool’. If we think instead of the double movement of linguistic withdrawal and advance, I think we can usefully apply the ‘deficit and surplus’ model of language to the use of tools and buildings. By taking the strange configuration of wood and metal and putting it to work ‘as-a-hammer’, I’m grasping it in a particular way, in both a physical and an intellectual sense. But of course I’m also missing out on many of its other possibilities as an object – ‘caricaturing’ it, in Harman’s terms, by taking it ‘merely’ as a hammer. But, at the same time I’m also invoking and entailing a whole new set of possibilities that are generally afforded to ‘hammer-like objects’ just like this one – As the old saying goes, when you’ve got a hammer in your hand everything looks like a nail. (Just as we can see with language – a word which is chosen for one reason brings with it additional layers of meaning). At the same time, in spatial terms it’s also true that buildings resist unexpected uses, and thereby stand out in our perception like Heidegger’s un-ready tool. If we manage to overcome this momentary obstinacy, obtrusiveness or conspicuousness, once successfully appropriated, spaces have the potential to take on new meanings. So, while the hammer I am wielding right now might not do the immediate job particularly well, once I have I have it in hand, so to speak, a whole series of other uses begin to become available. By the same token, if we take Heidegger’s example of ‘obstinacy’ where things seem to get in the way of the task, we can imagine a process of gradual modification – or deformation – involved in adapting a form to new uses. Either way, the language of equipment can be seen to evolve and proliferate – both into new forms and also into new activities. Dreyfus, H., Being in the World: a Commentary on Heidegger’s Being and Time, Division I, Cambridge MA: MIT Press, 1991. Harman, G., “Objects and Architecture”, unpublished manuscript, 2012. _______, Towards Speculative Realism: Essays and Lectures, Winchester: Zero Books, 2010. Heidegger, M., Being and Time, (trans., Macquarrie and Robinson) New York: Harper and Row, 1962. Merleau-Ponty, M., “On the Phenomenology of Language”, in Signs, (trans. R.C. McCleary) Evanston IL: Northwestern University Press, 1964. 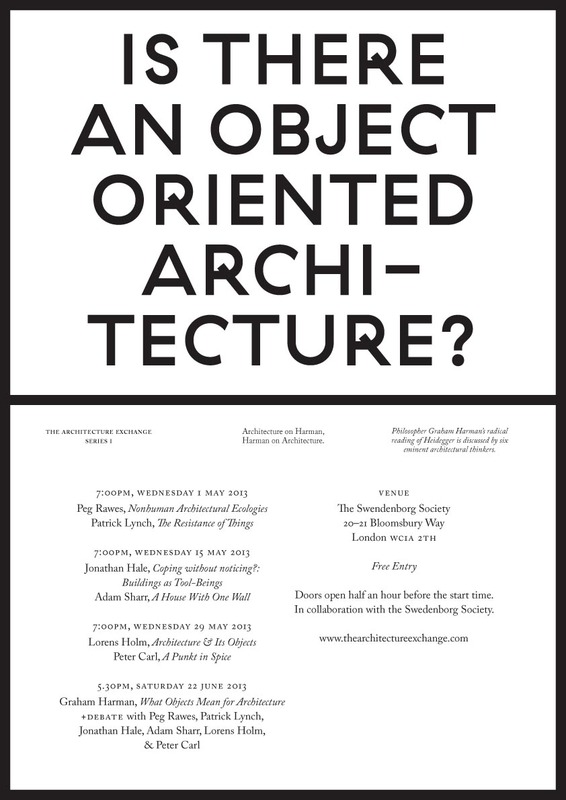 This text is an extract from a talk at The Swedenborg Society, London, in May 2013, organised by the Architecture Exchange, as part of a series on the work of Graham Harman entitled ‘Is There an Object-Oriented Architecture?’. A video of the full lecture is available here. Thank you to Joseph Bedford and Jessica Reynolds of Princeton University for the invitation to take part in the series. 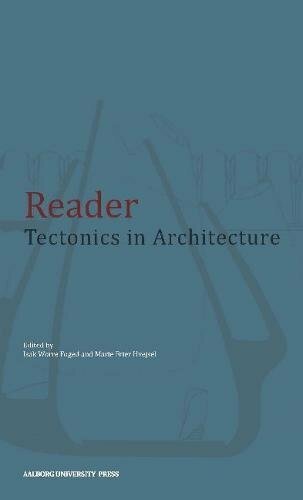 ‘Buildings as Tool-Beings’ | bodyoftheory <Loved it!